As always, our Chutzpah Barometer gets there first with the news of Duran Duran’s video with 1990s supermodel icons but now it’s been officially released. Rock stars rolled in glamour, Duran Duran, who have made some of the most memorable music videos of all time, have raised the bar yet again with the launch of their latest nine-minute short film, for the song “Girl Panic!”, taken from their recent album ‘All You Need is Now’. 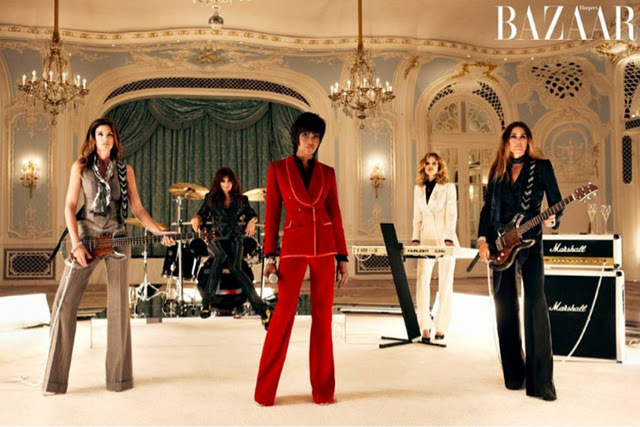 Directed by award-winning Jonas Åkerlund, the new video reunites five of the world’s top supermodels: Naomi Campbell, Cindy Crawford, Eva Herzigova, Helena Christensen and Yasmin Le Bon with the members of Duran Duran in a short film that was shot in London, in and around The Savoy, over two days earlier this summer. Supermodels, fashion, videos, …it almost takes me back to my Versace PR days, the ‘Famous 4’ catwalk show and the awe inspiring ‘Freedom’ video by the untouchable (well, allegedly, unless in Hampstead Heath) George Michael. Made in association with SWAROVSKI ELEMENTS, the ‘Girl Panic!’ video highlights the performance skills of the five ‘supers’ as they take on the roles of the members of Duran Duran, in a day-in-the-life-of expose. Bringing their monumental style, irreverence and distinctive personality to each character Naomi Campbell steps up to the mic as lead singer Simon Le Bon, Cindy Crawford strikes a pose as bassist John Taylor, Eva Herzigova embodies keyboardist Nick Rhodes as the only blonde in the band, Helena Christensen plays drummer Toger Taylor, while Yasmin Le Bonmakes a cameo as ‘the anonymous guitarist’. While the real members of Duran Duran appear as bellhops, waiters, chauffeurs and paparazzi, and designers, Domenico Dolce & Stefano Gabbana play guest fashion editors for the day during a photoshoot scene. The “Girl Panic!” video will be premiered on www.Vevo.com November 8th.